On 19th August, 2017 in joint venture with ATMA Raigad and State Department of Agriculture organized a farmers Rally at KVK Campus. The Sabhapati Panchayat Samiti, Roha grace the function. Deputy Project Director - ATMA, Taluka Agriculture Officer - Roha, Head - KVK, Raigad and representative of NGOs and Banks were present. Total 125 farmers, womens, youths were participated. In beginning speech of Hon. Prime Minister Shri. Narendraji Modi’s video clip was shown. Then main focus of New India Manthan - Sankalp Se Siddhi programme were highlighted. 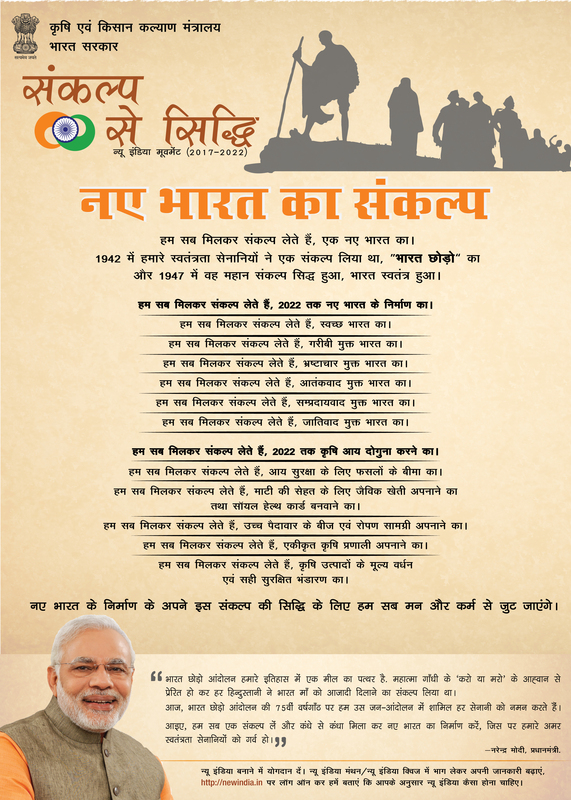 Then every one has taken a oath of Sankalp Se Siddhi – Pledge. Scientist from KVK were guided on various topics including crop production, Horticulture, Farm Mechanization, Fisheries, Poultry, Goats and Animal components etc. Brief discussion on how to double the income within 5 years were discuss. Progressive farmers presented their views regarding doubling the farm income by adopting latest improved technology. Image: Every one has taken a oath of Sankalp Se Siddhi – Pledge.